On Sunday market in Moema, Sao Paulo you can find any type of fruites and vegetables. Today I bought fresh coconut fruit and fresh shredded coconut. Just before I was suppose to finish shopping I saw beautiful strawberries which I could not resist. On my way home I had already a picture of dessert which I am going to prepare for my boys. Back at home I started with honey biscuit and it took me some time as they are quite tricky to do. Then I filled half of coconut fruit with vanilia icecream and strawberries. The last touch was to put honey biscuit and sprinkle some shredded coconut! Hmm...so good! Put oven at 200 ° C. Melt butter and honey in a saucepan. Add sugar and flour and mix to a smooth batter. Allow to cool slightly. Roll small balls of dough, make them flat and thin and place them on a baking sheet with parchment paper. Bake about 4 cookies at a time in the middle of the oven for about 6 minutes. Remove and shape them immediately into rolls. Readily to cool on a rack. Cut strawberries. Split the vanilla pod and scrape out the seeds. Melt butter in a pot. Add the strawberries, sugar, vanilla seeds and lemon zest and simmer for about 1 minute. Allow to cool. 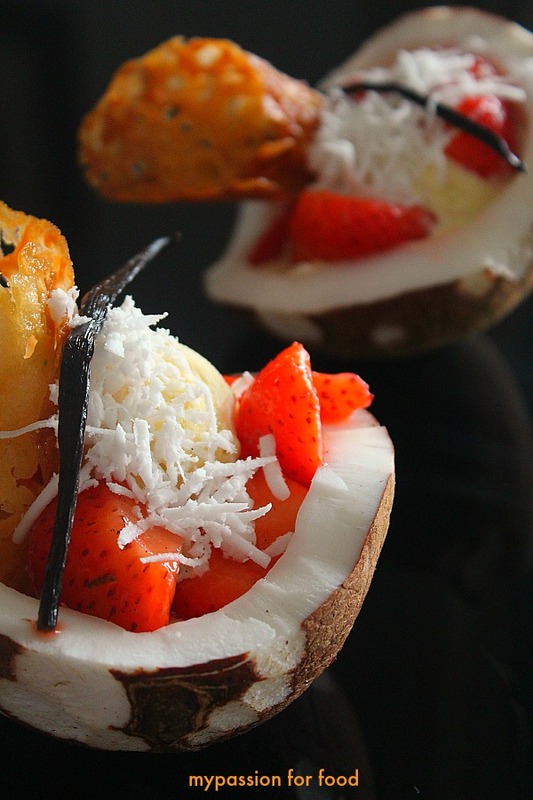 Serve vanilla ice cream in a coconut, add strawberries and decorate with honey biscuit. 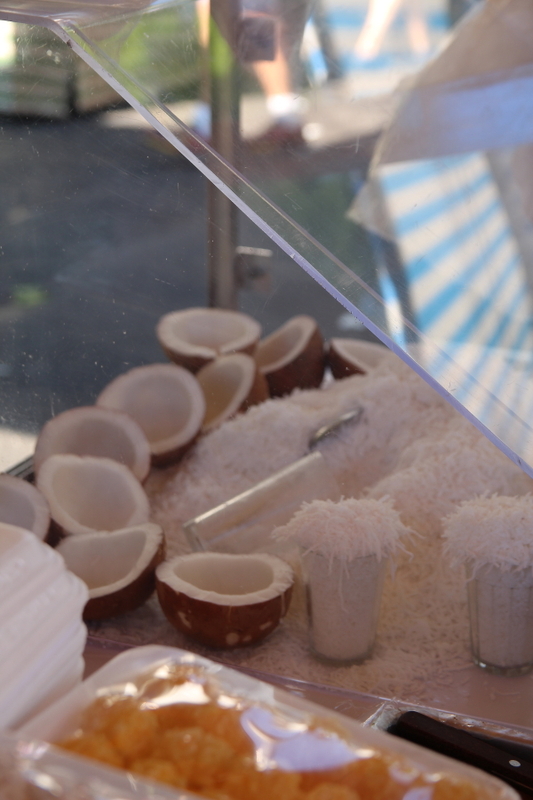 Garnish with fresh shredded coconut.